The Image Map Editor allows different areas of an image to have different URL destinations. Once the image is selected, click on 'Image Map Editor'. Select the shape required and select 'New Area'. 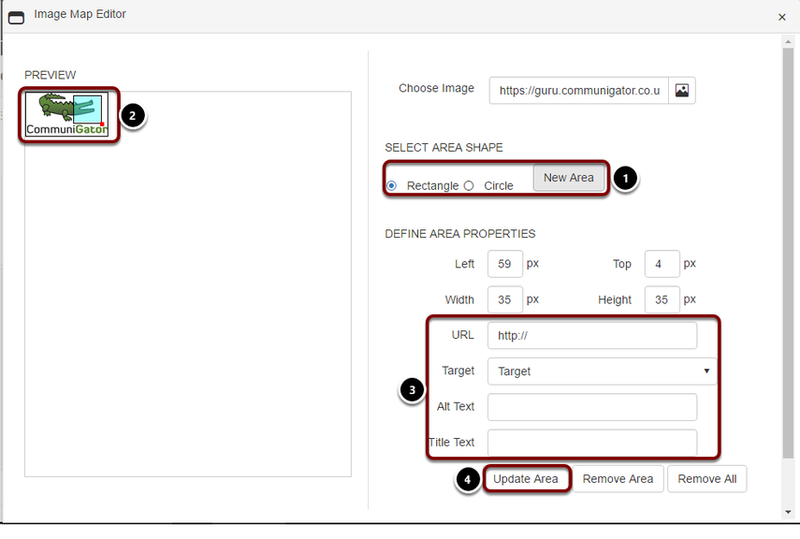 Select the new area to move it to the required position and use the small red box to re-size the area. Enter in the required details including the URL, the target, and enter a comment if required. Once you are happy with all the settings, click on 'Update Area'. If you want to add another area, select 'New Area' and follow steps 1-4. To remove an area, select it and click on 'Remove area,' or alternatively 'Remove All' to remove all the current mappings on this image.